Mark’s wake up challenge was go into a shop I’ve never been to before. I’m a 47 year old woman! There are not many shops I haven’t visited in my time. I scratched my head, I searched my mind. I visualised the street of the town I work in to see if there was any shops I hadn’t visited it. Having lived alone for many years , out of necessity I’ve visited most places even those that are often deemed male domains (rightly or wrongly) such as builders merchants and garages. Funnily enough a shop I often feel intimidated in is the butchers! Don’t laugh! I know their meat tastes better than supermarkets but I don’t know anything about the weight of sausages and the cuts of meat…when I do make myself go in I usual mumble or point to something that looks appealing and hope its ok. 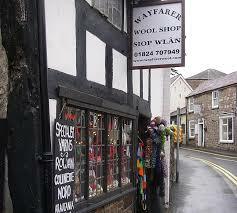 So, finally I had it… the wool shop. I don’t really knit. My friend encouraged me to dabble last year and it was relaxing but my creation was a bit messy. The wool shop in our town is tiny, it’s a bit quirky and I feel it’s the type of shop you only go into if you need some wool…so…I did feel a little uncomfortable going in, not only physically because its a tiny place and I felt a little bit like the big Alice trying to fit in through the door. The first thing that hit me was the smell of damp, but soon I forgot about that and enjoyed the colours of wool filling my line of vision. I didn't stay long so but I did venture over the doorstep but not sure if I would repeat this experience. Fi, at least you tried the challenge. That for me was enough and besides after not being able to go into GAME I feel I won't be repeating the exercise too. I'll make you a deal; I'll go into the wool shop and you go into the GAME shop (I can't get over the fact I think it's for geeks, ha, ha).